Shanaka is from Sri Lanka where he did his undergrads majoring in Botany and Chemistry. For his PhD, he is looking at the workings of the enzyme Ceramide Kinase. It is the only mammalian enzyme known to produce the lipid signaling molecule ceramide-1-phosphate (C1P) which among other things is a potent inducer of inflammation. Proper understanding of the CERK can lead to novel cures for a host of diseases including asthma, arthritis and cancer. 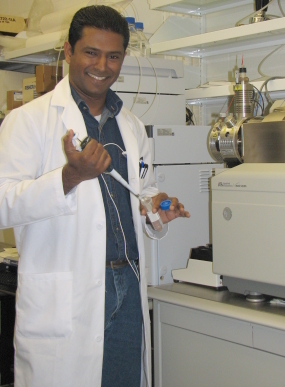 Shanaka has coauthored three publications, has shared first authorship with another, and has a publication of his own. He was the recipient of the 2005 Clayton award. He was also presented with a Student Fellowship Award for an oral presentation at the 3rd International Charleston Ceramide Conference. In his spare time he likes reading and dabbling with anything related to computers. He is also a lover of martial arts, especially Aikido. View Shanaka's Publications via the National Library of Medicine's PubMed.